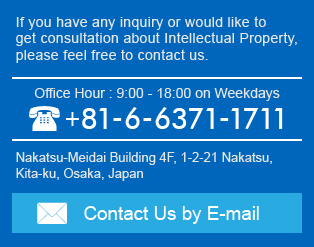 ISHINO INTERNATIONAL PATENT FIRM – We support to protect your products and your services globally by Intellectual Property. Our office is placed in Osaka, Japan. We support to protect your products and your services globally by Intellectual Property. Our office is placed in Osaka, Japan. About expenditure for domestic and foreign patent applications, foreign investigations, and countermeasures to imitation products, you can acquire grans or subventions of organizations if you satisfy the requirements. We support to utilize the grant systems actively.